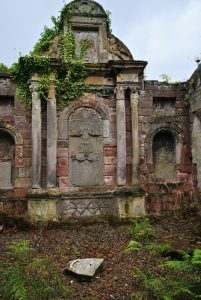 St. Mary’s Chapel yard in Inverness, an ancient burial ground right in the heart of the Highland’s capital, is but rarely visited, being somehow hidden behind high walls. Chapel Yard is one of three ancient burial grounds in Inverness and probably dates back as far as 1233. 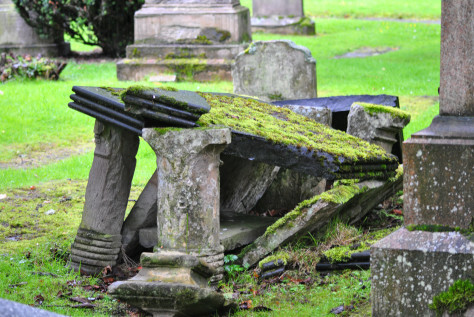 In the early days two churches with the same name existed in Inverness, no remains are left of the St Mary’s that stood on the burial ground. The ground once belonged to a monastery that was either Franciscan or Dominican. The people of the burgh would hold their assemblies here. Some of the graves date back as far as the early 17th century, decipherable are a few 18th century headstones, elaborate and plain side by side, both commemorating lost loved ones, in grandeur as well as in sobriety. Beautiful! I do find a certain peace when visiting old graveyards. I try to capture that feeling in one of my books (Powazki cemetery in Warsaw). But we have a few – only a few – with age and beauty in the States, too. Always a treat to come across them. Whenever I visit old graveyards, I am overtaken by emotion. There is a sense of peace, I agree but also deep sadness and loss bides there. An ache in my heart forms when I read the inscriptions on the headstones, especially those of babies and young children. The weather plays a role. 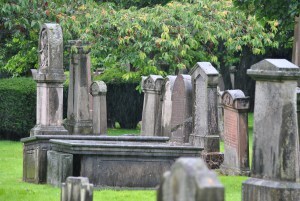 Graveyards are not the place to be on a bleak day!